A week later I’m in a pick-up truck jostling southeast along the main road out of Port Moresby, the capital of Papua New Guinea (PNG), toward Taurama village. Traveling even a short distance reminds one this is one of the most isolated countries on the planet. Just slightly larger than California, there are more than 800 languages spoken here, largely because contact between villages has traditionally been so limited. Add tales of cannibalism, deadly snakes, and tribal warfare to the lack of transportation infrastructure, and it is clear why PNG seldom, if ever, makes anyone’s Top 10 Travel Destinations list. This is a shame, as it is truly one the most beautiful, culturally interesting and biologically diverse places on Earth, and for a marine aquarist like myself, it is the aquarium tourism destination of a lifetime. 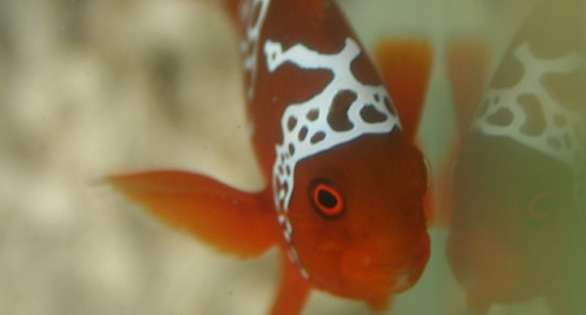 The marine aquarium trade came to Papua New Guinea three years ago. In that time, the people responsible for building the trade in PNG have experienced what every industry in PNG experiences: it’s hard doing business in such an isolated country. This is a double-edged sword, for while there is no doubt that PNG’s remoteness is responsible for the country being late to globalization, that isolation is also the primary reason the country’s natural resources, including its reef resources, remain intact. Today numerous industries have their eye on this largely unspoiled wilderness of tropical rainforests and reefs rich in resources. Add to these resources the country’s potential as a tourism hotspot and world-class dive destination, and it’s easy to understand why many outsiders look at PNG and see dollar signs—despite the obstacles. 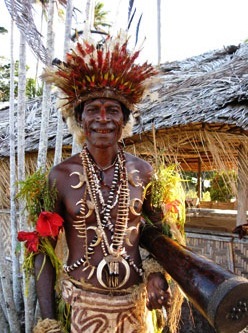 Tufi villager greets me and SEASMART in traditional native dress. As the pick-up truck swerves to miss a crater-sized pothole on the road to Taurama Village, I am poignantly reminded (as my head thwacks against the window) that this is a country on the verge. It is easy to be cynical about all the multinational companies with good PR and no real interest in understanding what appropriate socio-economic development means to Papuans. Many so-called foreign developers’ “projects” represent little more than an ATM to many villagers. Timber projects. Liquid natural gas projects. Oil palm projects. The list goes on and on. Fast money in exchange for something. In a country where the idea of a thing going away forever is often as foreign as my own pale skin under the tropic sun, selling resources to apparently well-intentioned outsiders is not uncommon. But how can selling a forest, for example, ever bring sustainable socio-economic gain to a village? Once the forest is gone, the animals are gone and so is the hunting. When the rains come, the terrestrial runoff stifles the lagoons. Reefs die and, with their death, so does the fishery. Will the initial money offered sustain the future generations of villagers who now lack the basic resources necessary to sustain themselves? In most of these projects, the real money will only be seen by a handful of Papuans and a small group of foreign investors. While the infrastructure in the urban centers designed to coax foreign investors and foreign money improves, the quality of life for the villagers remains unchanged or, in the worst cases, decreases. So what’s the answer? I’m reminded of a conversation with SEASMART’s director, David Vosseler, when I first arrived in PNG. Rejecting Copperband Butterflyfishes, Chelmon rostratus, on a SEASMART collection boat. Any with blemishes or signs of health problems immediately go back overboard. SEASMART is an acronym for Stable Economic Advancement through the Sustainable Management of Aquatic Resource Trades. “The name has evolved over the years,” Vosseler tells me, “but the goal has remained largely unchanged. The SEASMART Program is about developing a sustainable marine aquarium trade that supports socio-economic development.” In addition to directing the SEASMART Program, Vosseler is the founder and owner of EcoEZ Inc., a Virginia-based social and environmental consultancy. “In 2007, EcoEZ,” he explains, “was commissioned by the Papua New Guinea National Fisheries Authority (NFA) to carry out necessary resource surveys and market trials in order to draw a sufficient level of understanding on the commercial significance of the marine aquarium trade in PNG.” The results were promising, and in 2008, NFA contracted EcoEZ to carry out a one-year nationwide industry trial development program starting in the National Capital District and Central Province. In 2009 that contract was extended two years. We near the end of the road at Taurama Village, which overlooks a small inlet opening onto Bootless Bay against a backdrop of dark, cloud-veiled mountains of the New Guinea Highlands. Taurama, accessible by road from Port Moresby, is not particularly remote, but life here is very different than life in the city. Even with so much talk about captive breeding on the hobby side of the industry, upwards of 95% of marine aquarium animals are still collected from the wild in places like Taurama, and it is largely through these collection efforts that the marine aquarium trade gets its reputation with non-hobbyists. 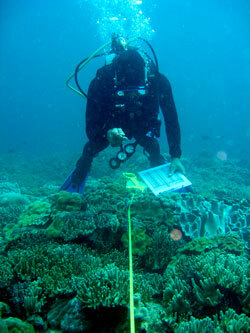 In recent years, the trade’s impact on reef ecosystems and developing island nations has received much negative press. In Tonga, for example, allegations of fisher exploitation and abuse have escalated to homicide, while, in the Banggai Islands, the trade has been implicated in the potential extinction of a species, Pterapogon kauderni. Unsustainably cheap animals continue to flood the market from places in the Philippines and Indonesia, where crowbars and cyanide prevail as collection equipment. It has come to the point that the trade needs to show that, rather than exploiting reef ecosystems and local fishers to their detriment, the trade itself can have a positive impact on reefs and appropriate socio-economic development of island nations. 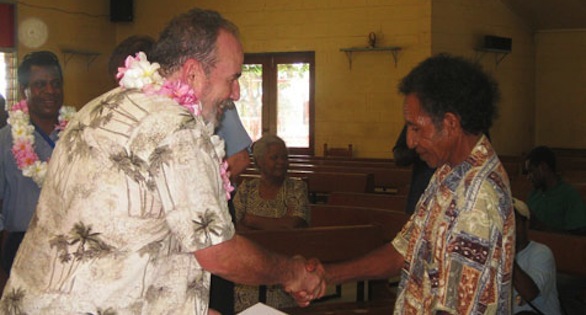 Taurama Village has recently become a Fishery Management Area (FMA) working with the SEASMART Program. An FMA is the base unit used in the management of the marine aquarium trade in PNG, and, at the time of my visit to PNG, there are eight FMAs. The process of developing an FMA and training fishers is not quick or easy, but the process itself insures that the industry in PNG is built sustainably from the ground up. Before any fishing is done, preliminary reef surveys evaluate the abundance of marine aquarium resources and the health of the ecosystems in each potential FMA. Baseline data for fish, corals and other invertebrates is collected by the SEASMART-employed Resource Assessment and Management (RAM) team to insure sound scientific assessment and monitoring of the FMA. RAM team member doing reef survey before collection begins. 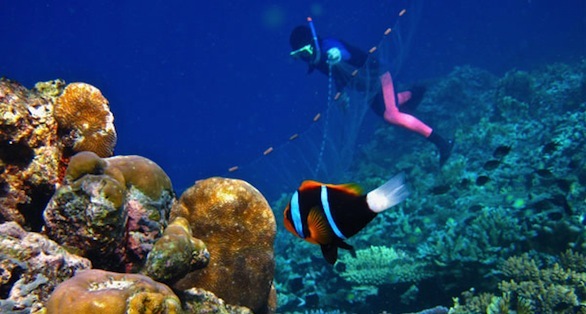 The SEASMART Program, through the RAM team, evaluates the effectiveness of management by monitoring coral reefs and populations of exploited organisms and comparing them to control areas. In this way, the effects of the trade on reef health and target species’ populations from aquarium fishing are constantly monitored, insuring a sustainable trade over time. After the initial assessment work, the SEASMART Program’s Fisher and Fishery Development team moves into the village to begin intensive training on everything from collection equipment construction and species identification to net collection, proper post-harvest handling and holding, documentation, and order management. 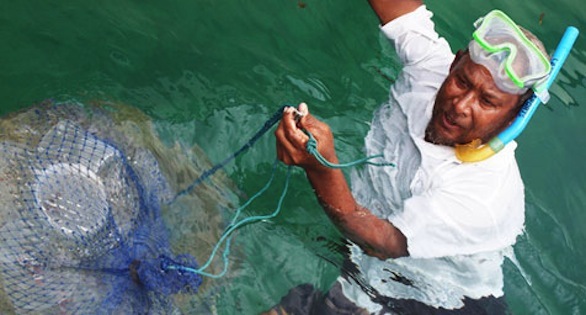 All collection in PNG is done with soft nets in less than five meters of water, meaning that well-trained PNG fishers provide hobbyists with some of the healthiest animals available in the trade. By the end of the training, the fishers and community resource owners possess the necessary knowledge, skills and techniques required to manage and implement an environmentally sustainable aquarium industry. The entire process is a model that can be exported to other areas where marine aquarium fishing is done. Spotted Boxfish, Ostracion meleagris, on a PNG reef in a collection area. 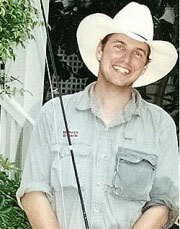 Good money, I learn, means that a marine aquarium fisher can earn the same wage as the best tuna fisher. That is close to the top of the pay scale in village life. While there is lots of disagreement amidst good-natured ribbing of boastful, albeit perhaps inflated, claims on what a good tuna fisher can make in a day, I consistently hear throughout my time in PNG that a good tuna fisher could gross US$300 in one trip to the food fish market. “You can earn that much collecting marine aquarium animals?” I ask in disbelief. PNG is, after all, a country where most people barely earn the equivalent of a US$1 a day. Net-caught and hand-collected are the cast-in-stone bywords for PNG SEASMART. The reality is very few PNG fishers will make US$300 from a single marine aquarium order, which may require three days of work. Nonetheless, the marine aquarium trade is providing a viable alternative source of income for some villagers and a very nice supplemental income for others. The more time fishers spend collecting, the more their proficiency increases, as is evidenced by the fact that the highest earning fishers are from the first FMA at Fishermans Island. 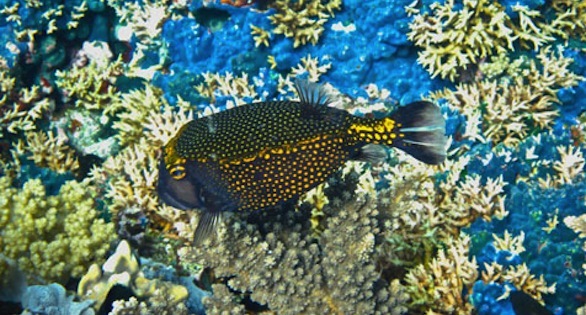 The PNG fishers are targeting many aquarium favorites like Pacific Blue Tangs (Paracanthurus hepatus), Copperband Butterflyfish (Chelmon rostratus), Auriga Butterflyfish (Chaetodon auriga), Dogface Puffers (Arothron nigropunctatus), and several clownfish species, including some of the most beautiful percula clownfish (Amphiprion percula) I have ever seen. They are also collecting some beautiful wrasses and some very unusual frogfishes. A few of the lionfishes are absolutely stunning. 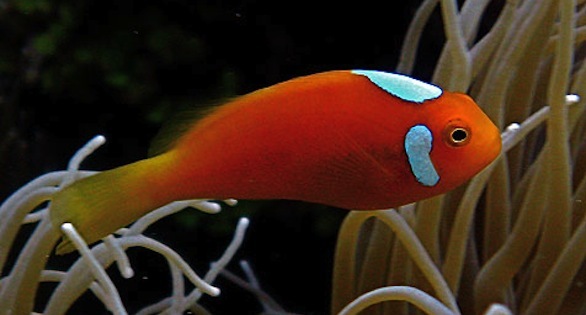 In terms of high-dollar fishes, while rare color morphs such as the Lightning Maroon Clownfish (Premnas biaculeatus), image below, earn a tidy sum, the Papuan epaulette shark (Hemiscyllium hallstromi) is one of the most commonly targeted fishes because of the money it earns for the fisher. At present, PNG is offering some very nice color morphs to hobbyists, but it is really the health of the animals that makes them such an excellent choice for aquarists. 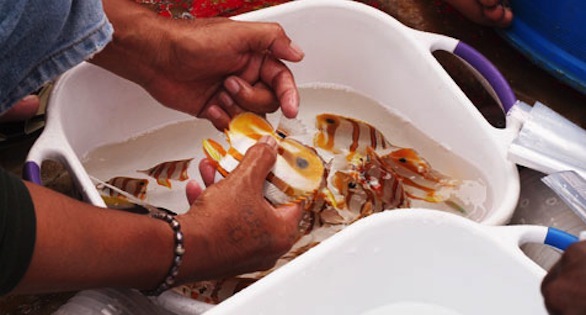 Because of collection techniques and post-collection handling, these fishes are arriving in Los Angeles in better shape than most animals from other countries. In addition to fishes and a variety of great looking invertebrates such as Linckia (Linckia laevigata) and Chocolate Chip (Protoreaster nodosus) Stars, SEASMART is currently working with local communities like Taurama to grow out stony coral frags to second generation for easy CITES approval, and PNG soft corals will be available soon. As I leave Taurama Village, I’m pleased that what I had heard about the marine aquarium trade in PNG is proving sound. While the trade in PNG is not without its very real challenges, from everything I have seen so far, it appears the triumvirate of sustainability, equitability and profitability remain the guiding principle behind what the SEASMART Program is doing. As such, the potential for the PNG trade to become a model that could be applied to other collection countries is very real. The biggest challenge, of course, is showing that this model can be profitable when it is privatized. The NFA and, by extension, the government of PNG is firmly behind the development of the marine aquarium industry in PNG at present because they see the potential to develop an industry that will support remote coastal villages that are presently falling behind the development of urban areas. The fact we are now rushing back to Port Moresby from Taurama Village in order to reach the house where I am staying before nightfall is indicative of the growing disparity between urban centers and remote villages. There is a settlement we must drive through to get to the house, and the driver explains it is best not to drive through the settlement after dark. Settlements are the result of a small segment of the country stepping forward, while the vast majority is left behind. Settlements have cropped up in urban centers throughout PNG as villagers migrate to the cities in search of an intangible promise evidenced by the hallmarks of globalization which will elude most. With rampant unemployment in the cities, too many of these urban migrants end up in settlements, where despair often leads to alcohol abuse, lawlessness and violence. “We should bulldoze them,” the driver says about the settlements, but clearly the solution is far more complex. Despite the settlements, Port Moresby is not a scary city compared to many where I have traveled. Like an adolescent taking those first tentative, albeit sometimes misguided, steps toward adulthood, Port Moresby is far from a finished product, but the overwhelming friendliness of the Papuans makes it a city in which the seasoned traveler can quickly feel comfortable. The heart of the downtown area, simply called Town, is a striking contrast to the outlying areas. Taking the elevator to the eleventh floor of the Deloitte Tower, where the National Fisheries Authority has its offices, on the day after my visit to Taurama Village drives this point home. Unidentified Pomacentrid that is proving to be a popular aquarium species. DNA testing is underway and a species ID will follow. I follow Kema Mailu, SEASMART Program Assistant Director, out of the elevator, past a saltwater aquarium the SEASMART program has installed in the reception area and down a hallway to the NFA director’s office. NFA Managing Director Sylvester Pokajam is in a meeting, so Mailu and I sit down to wait. I am pleased to have the opportunity to speak in greater depth with Mailu, as he is someone who grew up in a remote village. He is an advocate for development of the Nation, but development that will not leave the villagers behind and will not destroy the culture and traditions of village life. Mailu tells me about his frequent trips back to his village and the changes he has witnessed. “The urge for the country to get global recognition in its economic development planning and management has totally forgotten to bring into stream the rural communities,” he says. “This created a growing gap between the well-off urban centers and the rural areas. Papua New Guinea must reassess its development policy priorities and strategies so that the process of nation building begins from the bottom up—that is at the grassroot level,” Mailu tells me as we go into a meeting that will confirm Pokajam’s enthusiasm and support for PNG’s marine aquarium trade. A rarity found in PNG is the Whitebonnet Anemonefish, Amphiprion leucokranos, a likely hydrid of A. sandaracinos and A. chrysopterus. PNG is not the only developing island nation where the marine aquarium trade is working with sustainability, equitability and profitability in mind. Parts of the Solomon Islands, Fiji, Tahiti and a few other collection points are doing it right, but largely because of the visions and directions of a few foreign owners of collection stations. In PNG, the vision is for the SEASMART Program to show how a sustainable, equitable and profitable trade can be run and then to privatize it within the context of established government oversight. At this point, the SEASMART Program is not profitable, as every element of the project is still coming up to speed. With only eight FMAs located in only one province, volume, availability and species diversity is still too limited to secure the quantity of orders necessary from importers in the U.S., Europe and Japan to make the Program profitable. Government money, as well as money from other investors, is filling the void during the development phase, but the trial period is quickly coming to an end. As such, this is a critical time for PNG’s emerging trade in marine aquarium animals. It is also a critical time for the ecosystems themselves, and this is one reason why many people in the marine aquarium industry want to see the SEASMART Program succeed in establishing a sustainable, equitable and profitable trade in PNG. The degradation of reef habitats anywhere in the world is cause for concern, but in Papua New Guinea, Indonesia and the Philippines, the stakes are even higher. These are three of the six countries that make up the Coral Triangle, an area about half the size of the United States that is home to the greatest diversity of tropical marine species on Earth. More than three-quarters of the world’s known coral species and nearly forty percent of the world’s tropical reef fishes can be found here, and more than 200 of those reef fishes are found nowhere else on the planet. If these reefs crash, we potentially lose some of the most important marine life diversity on Earth. Some even argue that a crash of the Coral Triangle will have a domino effect that will eradicate all tropical reef life as we know it. Still largely off the maps of the diving masses and only recently opened to marine aquarium collection, Papau New Guinea has unspoiled reefs that all stakeholders want to protect from damaging exploitation. While some naively advocate the entire Coral Triangle be made into a marine protected area and no-take zone, the reality is that more than 120 million people are directly sustained by the resources in the region. Valued at more than $2.3 billion, the Coral Triangle, like PNG, represents big money to many industries, including the multi-billion dollar tuna industry and the largely untapped natural gas industry. The marine aquarium industry is admittedly a much smaller player in terms of global trade, but it still has a significant impact on the Coral Triangle. As many as eighty percent of saltwater aquarium fishes originate from the Coral Triangle, with the vast majority coming from Indonesia and the Philippines, and this is potentially the biggest impediment to the SEASMART Program’s success in PNG. David Vosseler, PNG SEASMART head, presents a diploma to a Papuan man who has graduated from fisher training. My time in PNG is coming to a close, and despite spending weeks looking at every aspect of the trade, travelling about the country, meeting fishers, diving on reefs, and eating a lot of really good food, I still have so many questions. Overall, I am cautiously optimistic about the SEASMART Program’s chances to accomplish a monumental feat and build a sustainable, equitable and profitable marine aquarium trade from the ground up in one of the most remote countries on the planet. As I write from my desk back home in Laguna Beach, California, I am receiving emails from contacts in PNG about survey trips and initial collections in other provinces. New FMAs are being established in areas that will give fishers access to new marine aquarium species, some of which are endemic to PNG and have yet to be seen in the hobby. On my trips up to Los Angeles, I am seeing more boxes arrive on a more regular basis from Papua New Guinea through importers such as Pacific Aqua Farms, Quality Marine, Sea Dwelling Creatures, Underwater World, and others. Beyond being cautiously optimistic, I am hopeful. I am hopeful not just about the SEASMART Program, but about the industry at large. As hobbyists, we have the ability to use our buying power to positively impact reef conservation and appropriate socio-economic development in developing island nations. We have the ability to show that this industry can truly be on the forefront of reef conservation and knowledge. 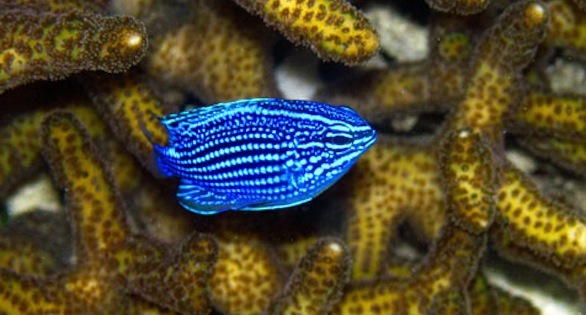 Every one of us with a saltwater aquarium in our home has the chance to introduce family and friends to the amazing, but often unseen, world of the tropical reef, where myriad colors flash through gin-clear water over an undersea forest of multihued coral sheltering a diversity of life found nowhere else on the Planet. We also have the chance to help people understand the challenges these ecosystems face. I am hopeful that we will, to use the cliché, do the right thing. For some of us, that will mean requesting PNG animals in the hopes that supporting a Program like SEASMART will have a transformative effect on the industry and, ultimately, will positively impact the people and resources upon which the industry relies. Ret Talbot is a CORAL contributing editor and coauthor of “The Complete Idiot’s Guide to Saltwater Aquariums” (Alpha, 2009). He lives in Laguna Beach, California.